Rita Moreno’s memoir is fascinating and full of juicy details. She has written a vivid tell-all book about her childhood in Puerto Rico, her move to El Barrio in New York and her rising star during Hollywood’s Golden Age. She tells us about her discovery by Louis B. Mayer, dancing with Gene Kelly and acting with Gary Cooper and Yul Brynner. Rita is frank about the racial and sexual discrimination in the film industry, and about her many lovers, including Elvis Presley and “bad boy” Marlon Brando. Best known for her iconic role as Maria in West Side Story, Rita soon found she couldn’t get any roles where she was not playing the spitfire Latina. But despite the self-doubts and the doors slamming in her face, Rita persevere and slowly conquered not only Hollywood but Broadway as well. Rita is one of the few performers—and the only Hispanic!—to win an Oscar, Grammy, Tony and two Emmys. 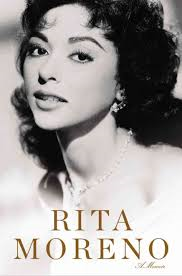 ABOUT THE AUTHOR: Rita Moreno is one of the few artists to win an Emmy, a Grammy, an Oscar, and a Tony. She has also received a Golden Globe Award and a National Medal of Honor. She recently concluded a sold-out run of her one-woman show, Life Without Makeup, at the Berkeley Repertory Theater in Berkeley, California, and regularly appears in the television show, Happily Divorced. Visit her at www.ritamoreno.com.